7.29 points at 24 votes (rank 263). G.I. Joe was created as a male counterpart to the Barbie dolls in 1964. 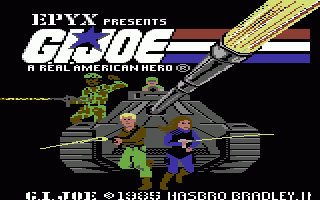 Over the years, the brand underwent many thematic changes and in the middle of the 1980s it was made into software by Epyx. At this point of time, the main topic was the fight between the good G.I. Joe team and the evil Cobra Organisation. 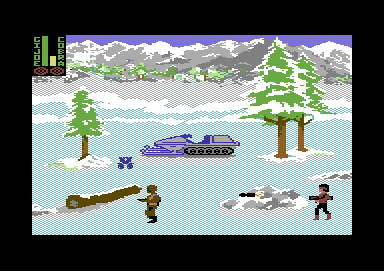 The game is divided into two parts, the fight by foot and the fight with vehicles. 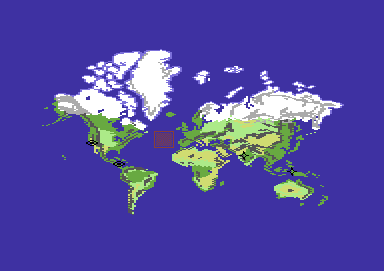 At the beginning you see the world map. Possible game maps are shown by flashing symbols. Ovals are for the fight with vehicles and the diamond shaped symbols are for the fight by foot. Each round can be played alone or in twos, depending on how you react when choosing the character for the Cobra Organisation. If you want to play in twos, you must in no case make a movement with the joystick in port 2, because if you move it in any direction, the character is selected randomly and the controls are taken over by the computer, although only for this one round. 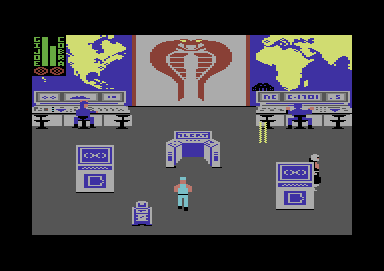 In multi player games, the player that represents Cobra must always first choose his character by joystick in port 1. The characters of team G.I. Joe. As "ground troops", the team G.I. Joe has the following twelve characters available: Duke, Scarlett, Recondo, Torpedo, Snake Eyes, Roadblock, Spirit, Zap, Gung-Ho, Snow Job, Blowtorch and Stalker. The vehicles for team G.I. Joe. 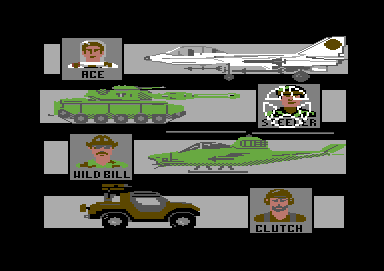 For the fight with vehicles there are four characters to choose from, which at the same time means choosing the vehicle itself: Ace, Wild Bill, Steeler and Clutch. The characters of the Cobra Organisation. Independent on whether you fight by foot or in a vehicle, you have the following characters for Cobra to choose from: Destro, the Baroness, Zartan, Firefly, Cobra Commander, Storm Shadow, Major Bludd and Scrap-Iron. Whereby Zartan is special here, as he will be "substituted" by a random G.I. Joe character for each game map. Choosing the "Map" on the world map. Depending on the geographical choice on the map, you fight in four different surroundings: the Cobra Headquarters, the desert, the Artics or a city. The aim is to hit the opponent with shots as often as it requires to use up his life energy. A "Best of 3" is played, so the one who wins two fights wins the round and the opponent is put behind bars. In each of the four locations there is an additional opponent that can be dangerous for both of the players and which you need to avoid. The fighters are equipped with different weapons as e.g. flame throwers, grenades, pistols or machine guns. They differ in the parameters of life energy, running speed, weapon strength, reloading time and speed of the projectile. In general: The faster the character, the less life points and the stronger the weapon, the slower the projectile and the slower the reloading time. You fight in these four "arenas". 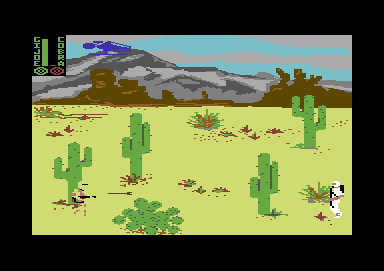 Some cacti serve as obstacles and cannot be shot through, so they are good to hide behind. At the sky, a blue or black helicopter is circulating, whereby the blue one plays for the team G.I. Joe and tries to hit the player of the Cobra Organisation, and the black one is in favour of the Cobra Organisation. However, the helicopter can also harm the own player. After one shot, the helicopter leaves the screen and either it returns or it is substituted by its hostile counterpart. There are also obstacles here, which can be used as hideouts. Additionally, a robot runs around in the street and randomly follows a player until it has touched him and subtracted life energy. Then he will practically be reset. You can fend it off by shooting at it. However, it can happen that the robot still follows the same target after a hit, or it might change it. It is certain that the robot's speed rises with every hit by the player, so it gets harder to avoid. Here, a small motorized vehicle is on the way that randomly shoots at one of the players. Again the usual obstacles. Furthermore, a Cobra appears irregularly in the background behind the computers and shoots into the room. The Cobra fires only at the member of the G.I. 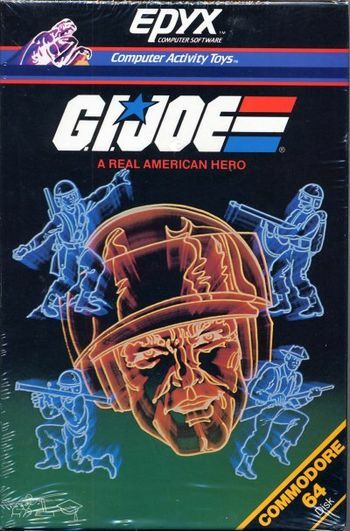 Joe team, but it can also hit the own player as long as the G.I. Joe player is in the middle of the screen. Here on the way with the jet. When fighting with vehicles there are four crafts available for the team G.I. Joe: the Skystriker Jet and the Dragonfly Helicopter for the single player mode, the Vap Mark II Jeep and the MOBAT tank for the two-player cooperative mode. The G.I. 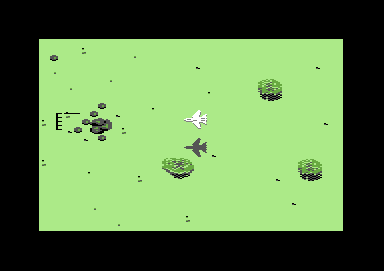 Joe moves his car on a game area that scrolls into four directions and needs to destroy HISS tanks, anti-aircraft-missile-launchers and radar stations. When getting hit or when colliding with a natural obstacle as rock or tree, the vehicle is destroyed. When three vehicles are destroyed the team G.I. Joe loses this round. To win a round, all eight HISS tanks need to be destroyed. Then the machine needs to be stopped or landed. Then all G.I. Joe team members that were captured run towards you and are ready for action again. The design is not bad for the age of the game. After choosing the game type and the fighterm the G.I. Joe headquarters is shown as loading screen. After each fight you see the headquarters of the Cobra Organisation with a short message in the shape of a scroll text at the lower border of the screen. The two fights are shown in the side view, you can move into all four directions, whereby up and down are the movements in the third dimension. The graphics are good and detailled for the age of the game. The fights with the vehicles are shown from the top. The vehicle can be steered into eight directions and the game area scrolls correspondingly. After each fight, the loser is marked as captured and cannot be chosen any more. In this game there is no end. There are always three characters on the Cobra side. 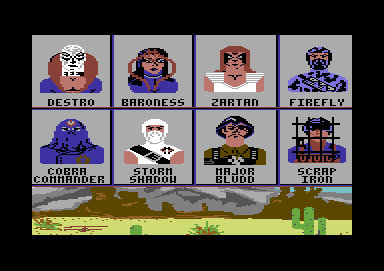 If the player has only three characters to choose from and loses one fight, a random character is made available. Joystick forwards to lower altitude and to land. Joystick left/right for a left/right curve. Watch out for your altitude! When the altitude display starts flashing you are flying too low and can collide with obstacles as rocks and trees. Both have an unlimited supply of air-to-ground missiles. To fire, press the fire button. The Skystriker Helicopter has a special ability. COBRA missile posts can fire heat-seeking ground-to-air missiles. If a missile has you as a target, you will hear peep sounds. In this case, try to get out of the missile's reach instantly! Two people are required to control these vehicles. The joystick in port 2 is for moving the vehicle. Move the joystick forwards or backwards to move the vehicle forwards or backwards. Pull the joystick to the left or right to drive a left or right curve. The joystick in port 2 is for controlling the direction of the shots. Move the joystick to the left or right to turn the gun turret. This does only work with the MORAZ tank! You can also use the keys "2" and "CTRL". Pull the joystick backwards to raise the angle for shooting (higher reach) or forwards to lower it (lower reach). You can also use the keys "<-" and "1". Press the fire button to trigger a shot. When the distance line starts to flash you are too close to the target object. You should not fire in this situation (capture). 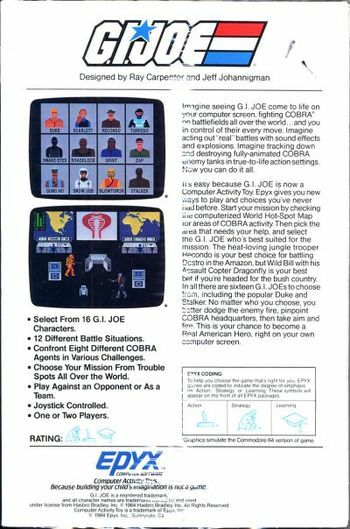 One player: You steer a team member of your choice from the G.I.JOE team against an opponent chosen by the computer. Two players: Port 2 steers the G.I. Joe guy and port 1 the COBRA agent. Movement is done by joystick (all directions), you fire with a press on the fire button. Each of the G.I. Joe team members and COBRA agents has his own abilities (weapons, strengths, weaknesses). Use it to your advantage. Playing on the emulator you need to take into account that parts of the programme need to be loaded in between. E.g. with VICE you need to load the game with the options "True Drive Emulation" ON and "Virtual Device Traps" OFF. This is exactly what is not possible as the game has no end. However, during the fight "man against man" it is advisable to always stay on the move, search for cover and know about the strengths and weaknesses of each opponent. The version by "Remember" contains next to some trainers as unlimited energy or fast loading also the manual. Additionally, some partially serious bugs of the original game were fixed. Quapil: "At that time I found the fight on foot was rather funny and together with friends the 4 scenes made a lot of fun. 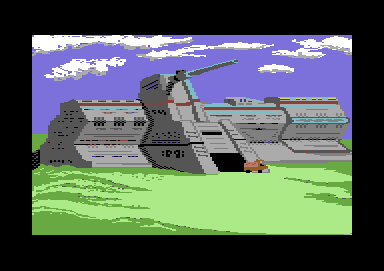 Epyx could have spared the part with the vehicles. The controls are a catastrophe, a round takes ages, this cannot be fun. Due to nostalgic transfiguration and a bonus for the succesful 2-player part I nevertheless give 8/10 points." Spaceball: "Wow! This was one of the titles that we played in great profusion. We have frittered away full weekends with this game." Rockford: "Excellent presentation and ... erm ... that's it. The game has no aim, it is endless and does not make sense. The score is missing, but this does not matter because if would have been daft anyway due to the endless concept. At that time I personlly felt I had been fooled by the game because I thought there was a kind of way how to win. The vehicle fillers are quite fun, but instead of the one-on-one parts I'd rather play Archon, because then I at least know what I invest blood, sweat and tears for. I know every pixel from the fortress in the loading pause, because I had to stare at it for hours. 5 points from me, which already includes 2 for the presentation and 1 for the title music." Fulgore: "One of the highlights from my childhood! I have to admit that it took me until the age of the internet to realise that the game is endless. In the past at school there were always many rumours about how the game could be played to the end, which logically never worked. Nevertheless have we spend many hours together while playing G.I. Joe AND we had fun! Only the mission with the jet was just too difficult. For the mode with the jet and the long, nerving loading times I subtract 2 points and give 7 (well meant) out of 10 points." As this is a game that never ends, no highscore is possible. This page was last modified on 8 April 2018, at 15:53.